This recap is a little late...but better late than never amirite?! Oh my gosh, where to even begin! Wanderlust is such a magical experience. Last year I went with my friend Sophie and had an amazing time, and this time around did not disappoint! Wanderlust is pretty much heaven on earth for yogis, especially yoga teachers. Last year I wasn’t teaching as much, so this time I got to fully take advantage of all of the amazing classes and teachers and gurus that come from all over just to teach at this festival. I took an average of 3 yoga classes per day and it was amazing! This year, Natura Wines approached me with an opportunity to be a brand ambassador for them…um WHAT?! An excuse to go to Wanderlust plus allll of the organic/vegan wine my heart could ask for? Done. I’m not a huge drinker, but Natura is seriously the stuff I reach for if I’m going to indulge. Natura is the #1 imported organically grown wine brand and is produced by Emiliana Organic Vineyards, the world's leading organic winery. Natura’s vineyards are pesticide, herbicide and fertilizer free- NO chemicals! All of Natura’s wines are certified organic by IMO and produced with 100% organically grown grapes, vegan, and sell for around $10 a bottle. Indulging and being social is a part of a balanced and healthy lifestyle, and Natura is perfectly aligned. 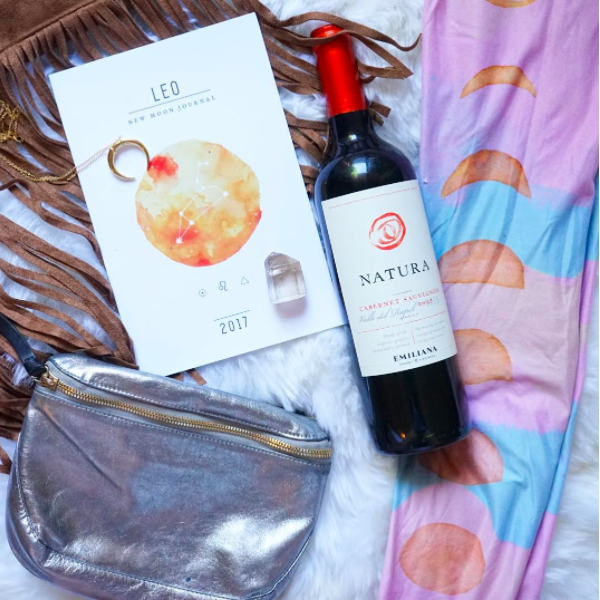 An excuse to go to Wanderlust plus allll of the organic/vegan wine my heart could ask for? Done. I’m not a huge drinker, but Natura is seriously the stuff I reach for if I’m going to indulge. Natura is the #1 imported organically grown wine brand and is produced by Emiliana Organic Vineyards, the world's leading organic winery. Natura’s vineyards are pesticide, herbicide and fertilizer free- NO chemicals! All of Natura’s wines are certified organic by IMO and produced with 100% organically grown grapes, vegan, and sell for around $10 a bottle. Indulging and being social is a part of a balanced and healthy lifestyle, and Natura is perfectly aligned. As one of the official sponsors of Wanderlust, Natura beverages were abound. I love the red varieties (especially merlot). Red wine contains heart-healthy antioxidants, so that’s what I grabbed at the Natura Happy Hour I attended on night one with my dear friend Rose of Sharon. After that, we attended a late-night 90-minute yin yoga class, which was just what my body needed after driving for 8 hours up from LA. The next day, we got up bright and early and ate delicious smoothie bowl breakfasts. We went to this amazing yoga class in complete darkness. It was indoor so the air conditioning provided some relief from the hot temps and scorching sun. Then I stopped by my friend Kiran’s booth, Wolven Threads to pick up some gear. She dressed me head to toe in her clothes so I could take over her company’s Instagram stories. For dinner, my friend Rose of Sharon and I rode the gondola up to the Farm to Table Dinner. We enjoyed Natura wine, Boochcraft, and sustainably farmed premium dining while soaking up the beautiful panoramic views of the Sierra Nevada Mountains from up above! We were pretty wiped after a long day, so we enjoyed a little live music and called it a night. The next day I had a shoot with Open Heart Warrior with JQ Williams as the photographer. We hiked up and found a secluded waterful and grabbed some amazing shots. After that, I met up with Rose of Sharon for an AMAZING soundbath experience. We signed up for a donation based 15 minute session with two other people in one of the outdoor vendor booths. They placed sandbags on our eyes and began playing traditional healing instruments such as shakers and gongs. I totally went to another planet. I had the most incredible experience where my vision jumped behind other people’s and I got to observe myself objectively through others’ loving eyes. Some of the people I knew very well, and some were just people I had met once or twice. I saw myself for the bright, bubbly, effervescent girl that I really am. This powerful experience is something that I know I will always carry with me. After the amazing sound healing session, I took the gondala up again met up with my friend Ash at high camp to hang by the pool for a dip before our long drive back to LA. I met this girl who wanted to try acro yoga with me. I had never done it before and it was completely terrifying! But the more I let go and trusted her the easier it was, and we got some amazing pictures too! All in all, Wanderlust was a magical experience! Magical place, magical people!! Even the trees alone are so grounding and cleansing. It really is a nice break from city life, and it's so cool to connect with other yogis from all over and conscious brands like Natura! I can't wait to return again next year!